Emiel Banningstraat 52, 2000 Antwerp, Belgium. Peaceful, convivial, comfortable and friendly...this is how our guests describe their home from home in Antwerp. On behalf of my staff and myself, I would like to wish you, a pleasant and carefree stay in our hotel. Enjoy your visit in Antwerp an oasis of tranquillity and hospitality. Just as soon as you cross the threshold of this carefully restored, stately mansion, you become conscious of the calm surroundings. The pastel decoration, soft music, and personalized attention, all provide you with a warm welcome. 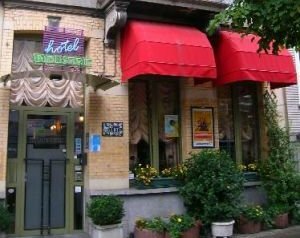 The Hotel Industrie offers you a stay full of peacefulness and comfort. New in our lobby free cable Internet ... Everyone feels at home here. The active businessman comes to relax after a stressful day, while the tired tourist comes to rest after a day of fascinating sightseeing in the old quarters of Antwerp. And in the morning, after a refreshing, undisturbed night's sleep in one of the thirteen attractively furnished rooms, you will enjoy a sun-drenched table laid with a lavish and healthy buffet breakfast. Sit back with your local paper or your favourite financial daily as the coffee is served. Heavenly! Every room is equipped with a bathroom and toilet, mini-bar, safe, telephone with a direct outside line, radio, and 24-channel television. Day and night, we will welcome you with the same attention. Internet services and WiFi are available free of charge.There are internetcomputers available in the lobby free of charge. Parking fee required (7.00 €). Near exhibion centre, Near trainstation, Near to the university, Centre, Museum Area, Near highway, Near the historic centre, River, Near subway / tramstation, Near shopping centre. More than 1 days before arrival : no cancellation costs. Less than 1 day(s) before arrival : 1 night will be charged. Children less than 2 year(s) old: free of charge. For older children and adults 25.00 € for each additional bed is charged. Visa, Diners Club, Maestro, Mastercard, BCC, Pinpas, American Express. 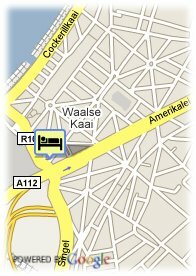 Hotel Alfa de Keyser is a luxurious 4-star hotel in the city centre of Antwerp close to the Central Station.